Is This The News Oil Investors Have Been Waiting For? The U.S. Energy Information Administration says that American oil companies are getting closer to balancing capital investment and operating cash flows. This is great news for energy investors, but it doesn't mean every oil company is worth investing in. Less spending on these may be really good for oil investors. Image source: Getty Images. On July 18, the U.S. Energy Information Administration released a report that shows a great trend: U.S. oil companies have begun steadily narrowing the gap between capital investments and operating cash flows. What exactly does this mean? In short, that America's onshore oil producers, which have been bleeding cash for years, are starting to move closer to actually living within their cash flows. And that could be music to many oil investors' ears. Over the past five years, companies substantially increased investment spending to raise production. In 2012 and early 2013, operating cash flow was about half of capital expenditure, making external finance necessary to pay for investment in production growth. And while cash from operations has also fallen, driven down by lower oil prices, capex has fallen by more across the industry. Furthermore, some capital spending is necessary simply to maintain current levels of oil production. According to oilfield services company Core Laboratories N.V. (NYSE:CLB), projects that U.S. onshore oil production will fall 1.1 million barrels per day this year at current oilfield activity levels. And while a decline in domestic oil production should help restore global supply and demand balance and push prices higher, it's a reminder that there's only so much oil companies can cut from capital spending before it hurts cash from operations even more. What does sustainable capital spending look like? 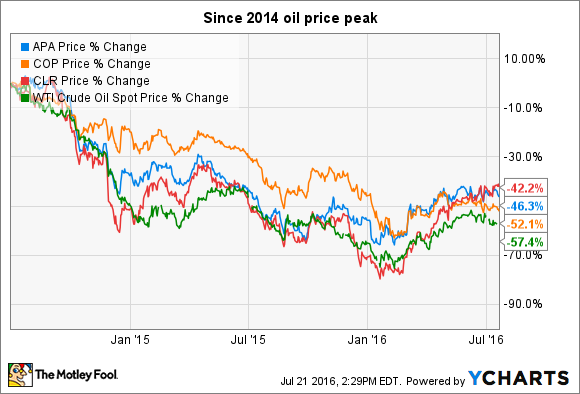 How much (and how quickly) will oil prices recover? The answer to the first really depends on each company: How much it costs to drill in the assets it owns, what its return on capital is, and how much it can realize per-barrel for those assets. The second is even harder to answer, and frankly it really affects the first question, since it all comes down to oil prices. One big thing that's helping Continental and Apache is significantly cheaper drilling and operating costs. According to Continental's most recent investor presentation in June, its production expense and cash general & administrative costs were $4.87 per barrel of oil produced last quarter. That's down from $7.87 per barrel in 2012, one of the lowest levels in the industry. 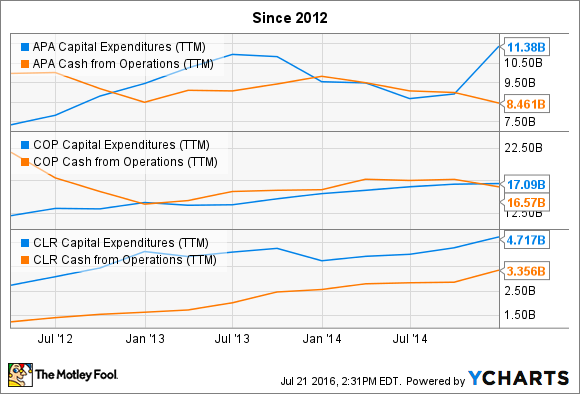 Apache has seen its costs fall as well. Through the first quarter, the company's cumulative well costs have declined 45% since the start of 2015, while its overhead cash costs were down 19% over the same period. As Core Laboratories points out, global oil production from currently producing assets will decline 3%, even with nominal capital investments. In other words, more capital spending is a necessity simply to maintain current output -- much less meet growth in demand. But at the same time, it's going to take a combination of higher oil prices and lower production costs for oil companies to be able to balance capital spending for growth with cash from operations. 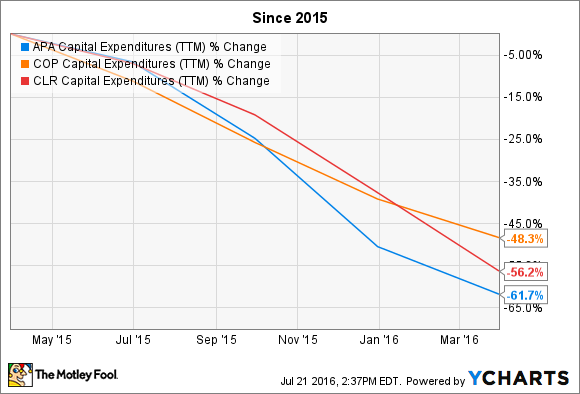 For now, though, it's a good sign that capital spending continues to fall across the industry. After all, the current environment was a product of too much aggressive investment too quickly, which resulted in more oil than the world had use for and oil prices still down more than half 2014 levels. Are these oil producers worthy investments today? As things stand they're all still spending more than they're making, but like the industry trends suggest, the gap is narrowing. The rebound in oil prices during the second quarter is likely to have narrowed the gap even further. As Mr. Barron put it to me in an email, "Crude price stability and continued access to capital will ultimately be a major factor in investment decisions. Major (oil price) moves are very disruptive. As things stand now though, the industry could be looking to move on from the price crash." That's likely to be the case for these three companies as well.